Last week myself and Adam got to carry on our Operation Battle Ax mini-campaign. 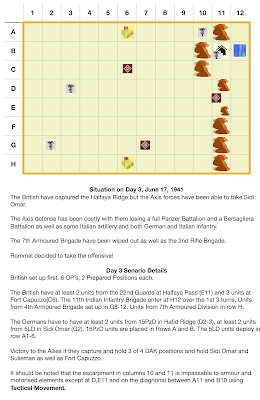 If you will remember from our first game, the Brits successfully captured the Halfaya Pass but had lost Sidi Omar. 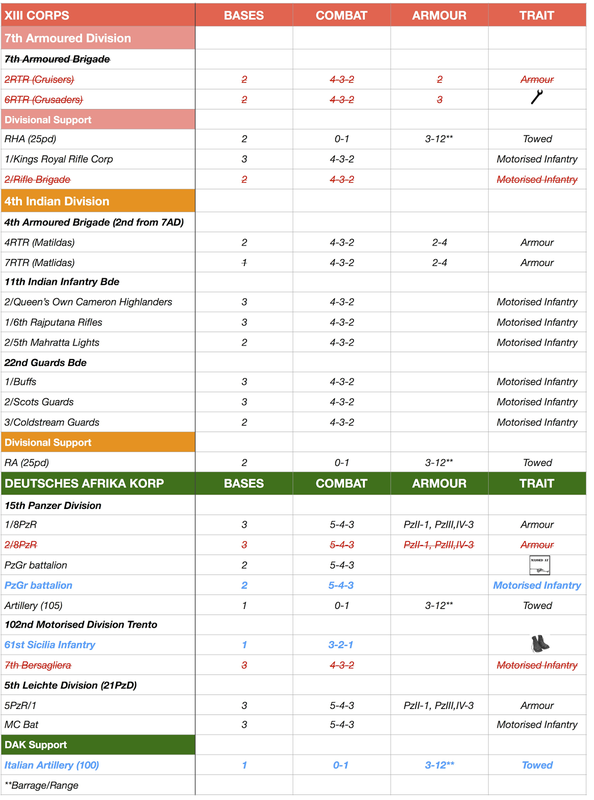 The Axis lost 10 companies, while the Allies lost 6 companies as you can see below. Here is the terrain as it was set up for day 3. I actually changed the victory conditions adding that in addition to below the Axis had to re-capture Halfaya Pass to achieve complete victory. So I think a bit of a challenge for the British, but at the same time the Axis have a significantly diminished force with which to re-capture Halfaya Pass. Otherwise it would be a marginal Axis victory. Initial Axis plan was to retake Fort Capuzzo which they lost on day 1 one of the battle. 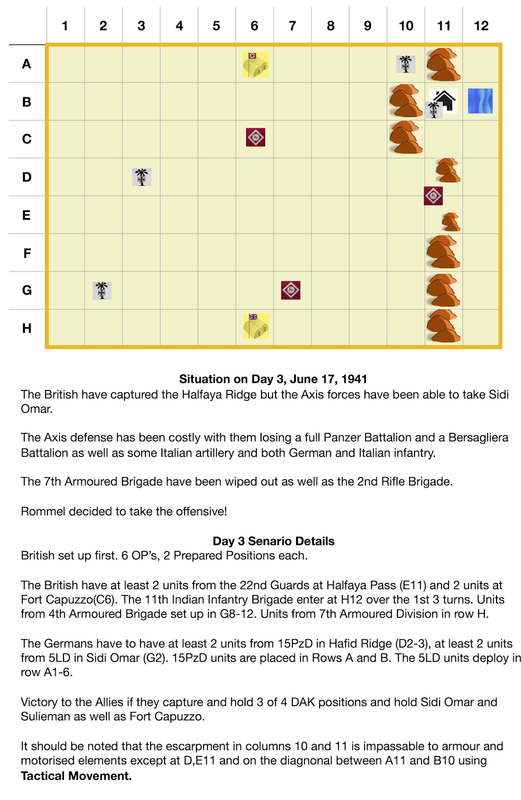 The 11th Indian Brigade pounded Sollum throughout the game. At this point darkness fell and the game was over. 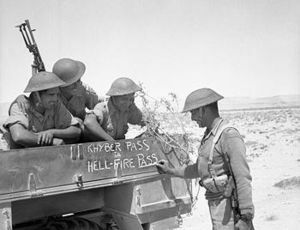 The British had been successful in retaking Sidi Omar and holding the Halfaya Pass which the Axis were never able to an attempt a re-capture. The Axis were able to take Fort Capuzzo. So a Marginal Axis Victory. You can see Adam's AR and more photos on his blog. It was quite a fun game and the scenario worked well. I hope to expand the scenario into a mini-campaign for all 3 days of the battle. It did appear to work well for the ruleset. Nice looking game. 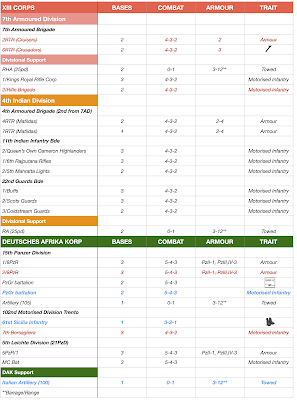 I'm going to try Rommel in 15mm with this scenario, this year, all being well. Well done John - looking great.